I have a mill and are thinking of the cnc conversion myself, but not sure of the real world advantages for the home shop that is mainly making 1 of something. I hear this a lot. Suppose the one piece is a curved spoke flywheel? Or maybe a Stevenson link. Things like this can be setup and run at one pass, maybe taking a half hour or so. I suspect you couldn't even get the rotary table set up for i ts first cut in that time. I will admit it can take some time doing the CAD and CAM, but its still a lot faster on CNC. And speed alone may not be that important, its a tool that lets you do vastly more complicated parts you probably wouldn't even try without it. Replacing the rotary table for any curved profile is the first obvious advantage. I sold mine after not using it for a couple of years. Thread milling studs is much easier and faster than single-point threading or using dies. Manual machines still get plenty of use alongside. Also, when it comes to 3D surfacing there are things that you can do with a CNC, that would be pretty hard to do on manual machines, if not impossible. Attached are a couple pictures of the intake valve body that I made for my Pacific Vapor Engine using 3D tool paths. Not saying this part couldn't be made by other means, many have; just trying to show some of the fun things you can do with your CNC mill. I always think bits like that are really impressive Dave but I wonder how long they take to make . Jo, to some extent you can let the CNC machine get on with its own thing leaving you free to work on other items or just fondle castings. Also none of those dark silver solder lines you keep moaning about when others use soldered fabrications. Plus with spindle speeds of 5000rpm or so the tools can be fed much faster than with old iron machines so the cuts don't take as long. Having just got a CNC machine I can already see uses for it that would be far easier than doing by hand. The Forest Style engine that I'm working on at the moment has several parts that would have been ideal for this and saved many setups with the rotary table or working with co-ordinates. I've already got my name on the list for a new engine design which the drawings should be ready for later in the year, 3 parts on that are crying out to be CNC cut one of which is a wavey spoked fltwheel. 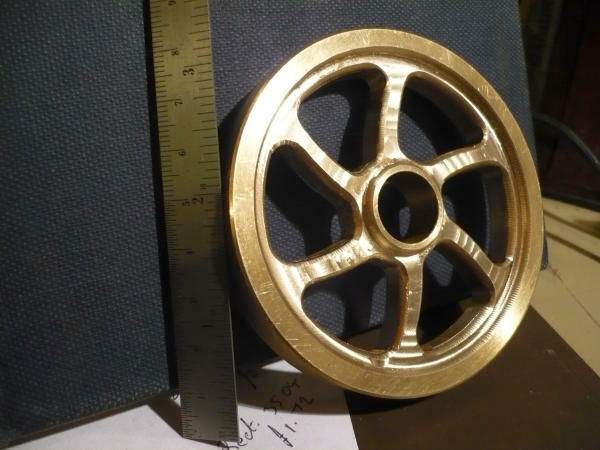 But how many hours to do something like that brass flywheel manually, could you draw and machine that in 40mins? ARC are doing the small Sieg for just under £3k and giving others away! Yes you could convert something for less but for those not into all the electronics the ready made machines are plug and play. Also you get things like much better bearings and spindle compared with the similar sized manual machines as well as a lot more subtle differences such as reprogrammed chips to get the best characteristics out of the brushless motors at speed which you don't get just by sticking ball screws and steppers on a standard machine. Also the KX1 is nothing like a X1 mill under the outer casing. I'll carry this on in my "Going over to the dark side" thread rather than hijack this one any more. Guys, lots of great discussion on why to use a CNC in your shop. I always believed in using the correct tool for the job, and have found CNC fills the bill for the more complex parts. Even simple ones like cutting a lever out of sheet metal. So, a lot of the electronics has arrived, and I have bought a Windows 7 computer to upgrade my old XP box. I have downloaded the Mach4 trial version, and I think I'll like it. One thing I noticed, but was able to fix was the tool table size. I have a tool numbering scheme that uses 256 numbers. Fortunately I was able to configure the Mach 4 tool table to 256. That would have been a killer. Now for the second killer question. I used the nesting feature in Mach3 more than a few times, and I can't do without it. I don't want to buy nesting from BobCam. What is the difference between using C7 ball screws and C3 ballscrews? Apart from cost? Any info will be appreciated. Neil, if I understand correctly, the difference between the C grades of ball screws is the accumulated error with length. (rolled ball screws) So, a C3 ball screw would be a lot closer at say 6" from zero then a C7 would. It depends on what you are trying make. I think most hobby mills are fine using C7. If you are trying to make large professional parts, C5 would be better. C3 would be even more accurate over length. Look at the specs. Ground ball screws will be more accurate over the shorter lengths. With the C7 and C5 the specs look terrible to me. If trying to make parts to 0.02mm can they be tuned to be able to do that on the C7 or C5 ballscrews? Or do I need to have C3 or better? Looking to be able to achieve better than 0.02mm over a 280mm long part with a home machine. I would say you are dreaming. Bad Behavior has blocked 16075 access attempts in the last 7 days.